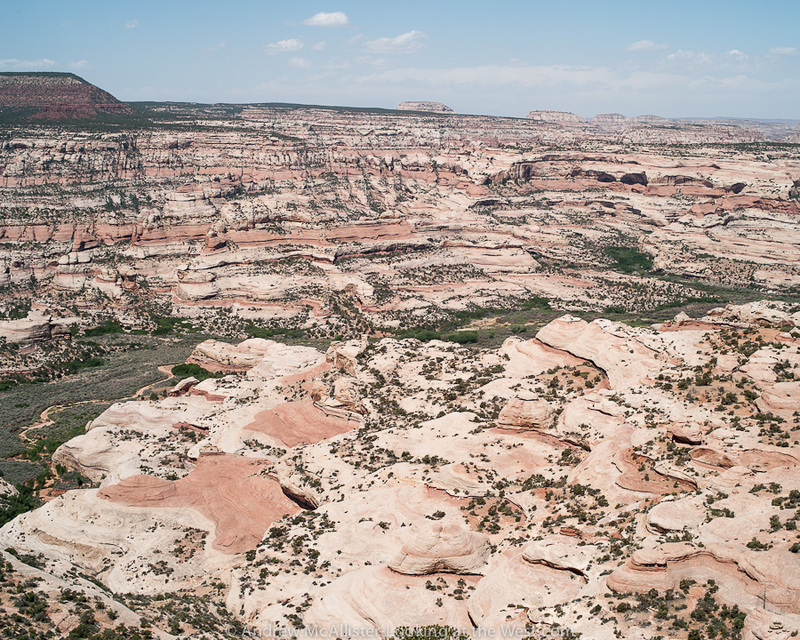 Above: Mesa’s along Route 211 toward the Needles District of Canyonlands National Park. This image was taken at the end of our drive to Beef Basin. In the casual photograph it’s hard to get a feel for how massive these forms are. 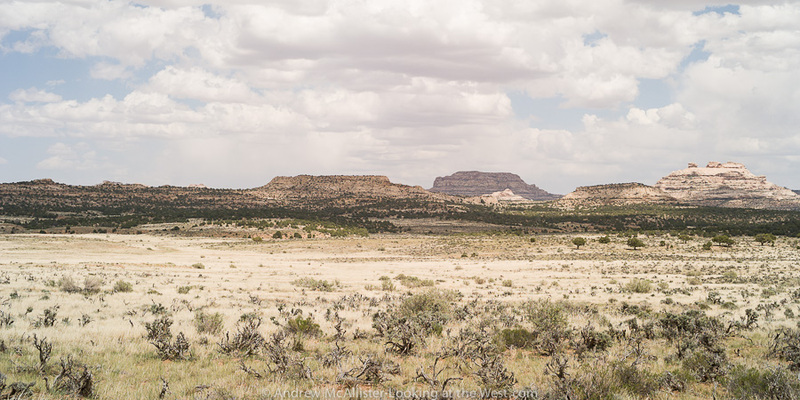 To capture that feeling I chose to use a normal focal length lens and a position that would not include the top of the mesa. When you see the fence at the base of the mesa you start to get the feeling of how massive it is. 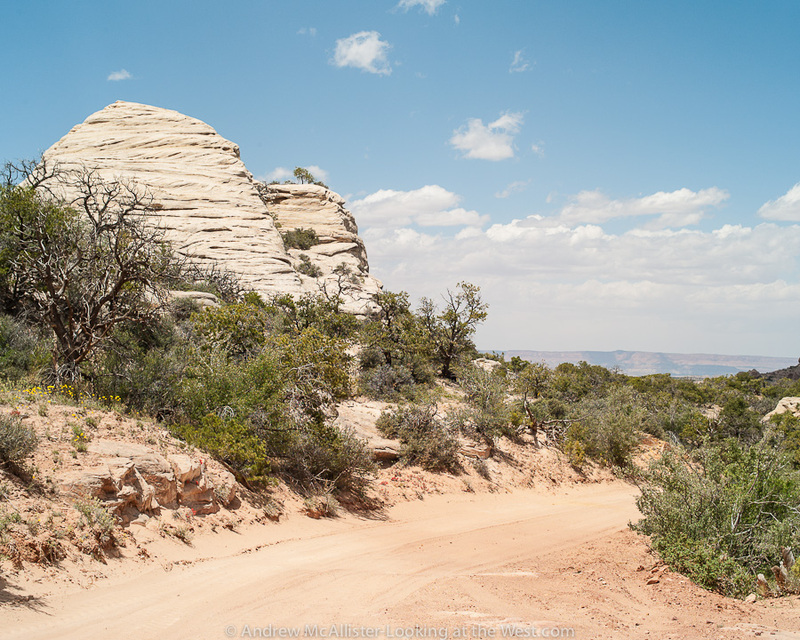 Above: Cottonwood Canyon Road as it rounds Bridger Jack Mesa. Notice the car on the right side for scale. The road was in really good condition (May 2012) with a few washboarded sections and small obstacles. I think of these roads as the domain for 4-wheel drive vehicles but as with other trips you come across the odd car that you wonder how it got there. On this drive it was an old Volkswagen Squareback (early 70’s) in mint condition complete with a driver with small round sunglasses and a waxed mustache. Above: Salt Creek Overlook. Near Cathedral Butte there is a side road that will take you out to this viewpoint. 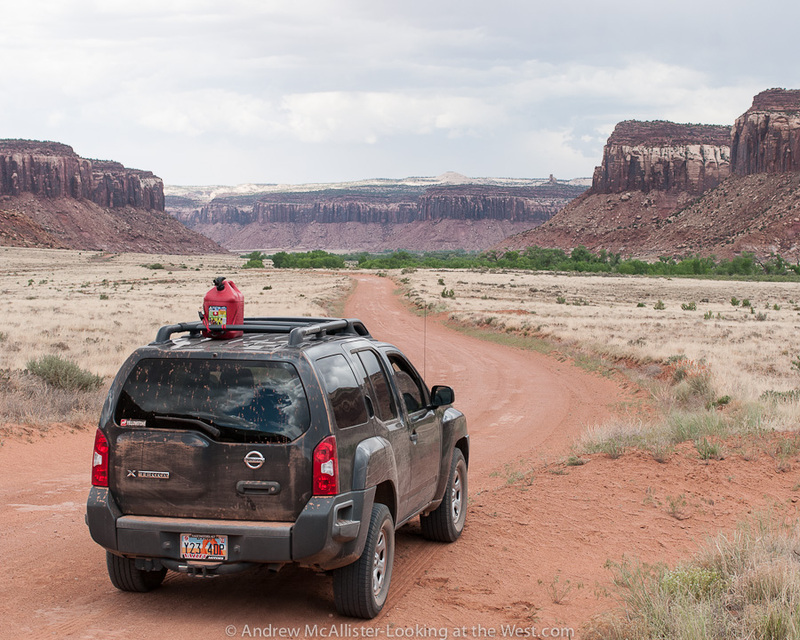 In the book Guide to Moab, UT Backroads and 4-wheel Drive Trails this section of road is listed as moderate as it is quite rocky. We drove halfway in before deciding to walk. With a little more experience I could have driven it as the Xterra has the ground clearance but today was not the day to attempt it. Next time for sure though. The walk out to Salt Creek Overlook was a easy and a nice change as we had been in the car a few hours at this point. Above: Almost to Beef Basin we stopped for a look at these large white rock formations and to stretch our legs a bit. Just after this section of road there is a steep and sandy section with large rocks and a blind corner. A bit stressful as it was my first such stretch of road however a few miles later I would be reminded that thousands of cars have made it back up that the steep sandy spot when we came across the old Volkswagon. Above: Classic western landscape of Beef Basin. 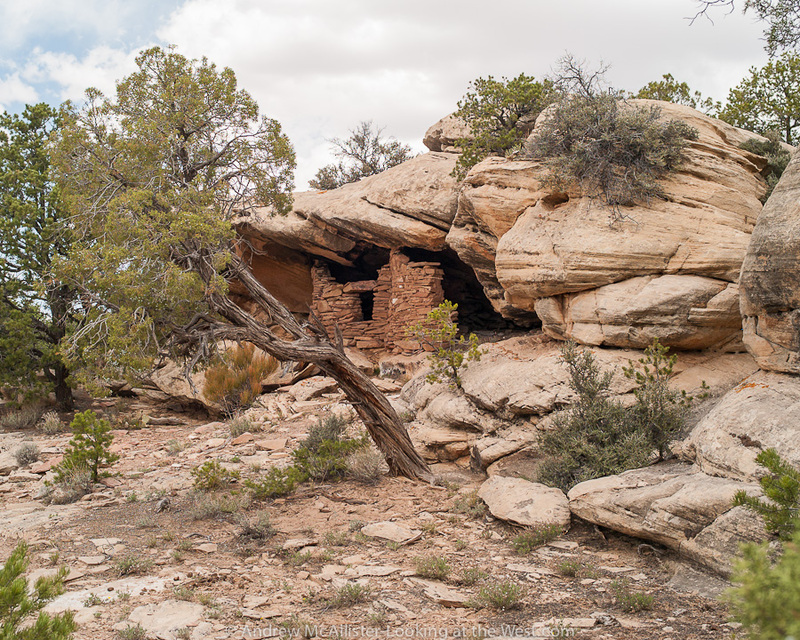 Below: One of the many ruins in Beef Basin. 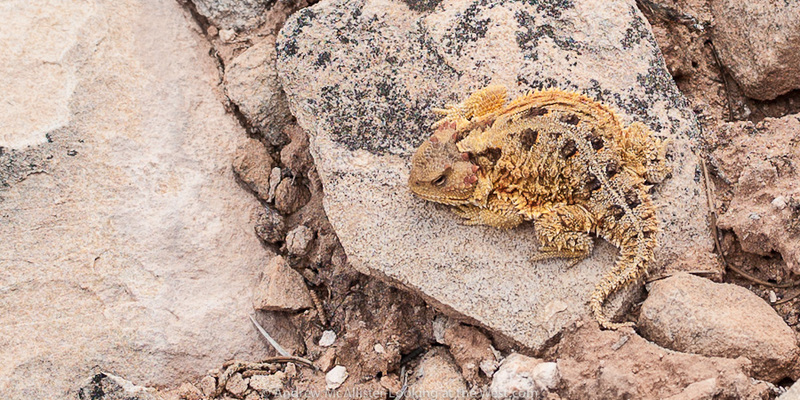 Below: Greater Short Horned Lizard spotted at South Spring Campground. 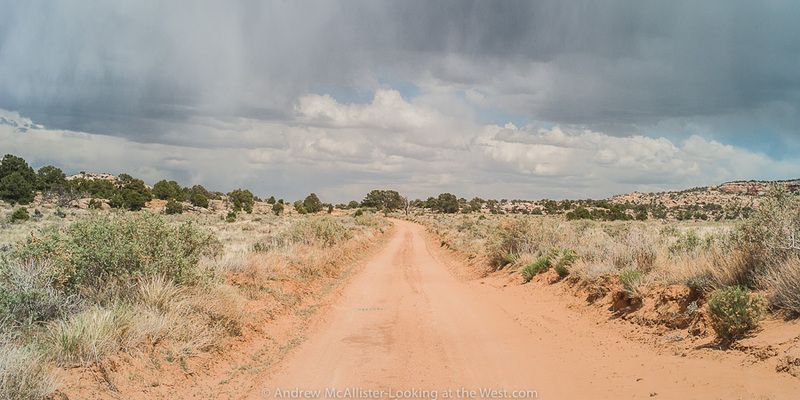 Below: As we finished the Beef Basin loop the weather started to look as if a storm was brewing. 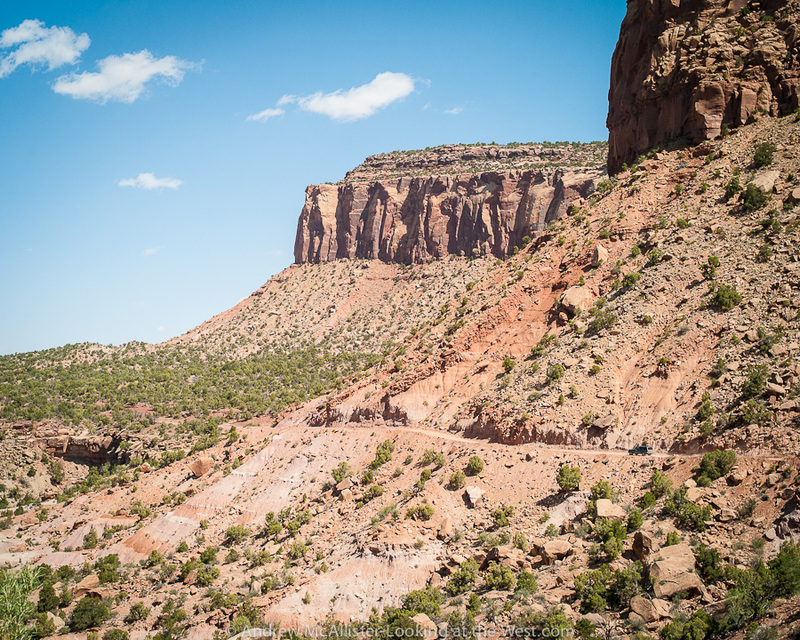 We decided it was best to start our return as it would be a few hours until we reached asphalt and another hour to get to Moab. Fortunately the only weather encountered was random spots of raindrops and nothing that would make the return trip difficult. Below: The Xterra on Cottonwood Canyon Road. I brought extra gas not knowing what kind of milage we would get on the back roads or what we would run into. Turns out we only used a bit more than half a tank up to this point. In the future I hope to replace the rear bumper with one that will accommodate the spare tire and have room for Jerry cans so I don’t have to keep the fuel on the roof. Stunning landscape…. (and that’s quite a lizard!!). Great Photos – love that you captured a lizard; so cool looking! Have a Great Week! As always, excellent photos! Beautiful country. Seeing your photos are always bittersweet. I want to be where you are! Great photos, as always. Fabulous adventure, thanks for letting us ride along! Love those Wingate Sandstone cliffs. Breathtaking landscape! And a creepy creature right there!!! 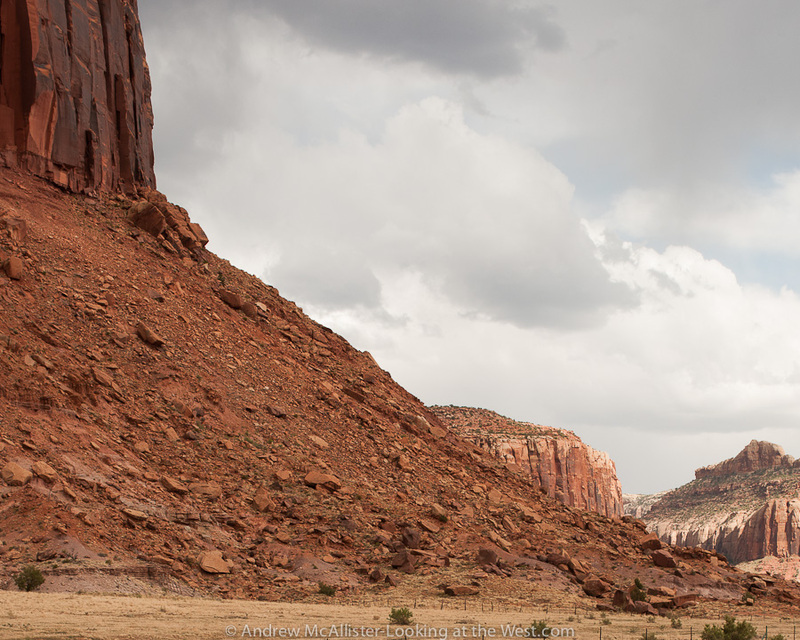 I love these landscapes from the canyonlands! A great series you show us here from this magnificent landscape. It looks like there are two Beef Basin Roads on Hwy 211. After passing the Newspaper Monument, do I turn left on the first BB Rd or the second one? I can’t wait to go next month. Beautiful photos. Thanks for any input. I’d have to look at a map but it’s well marked on the road. I believe the first road goes to a ranch of some sort and the second is the road to beef basin. Just look for the road signs, it’s a well marked route. last picture just for me to dream awake.